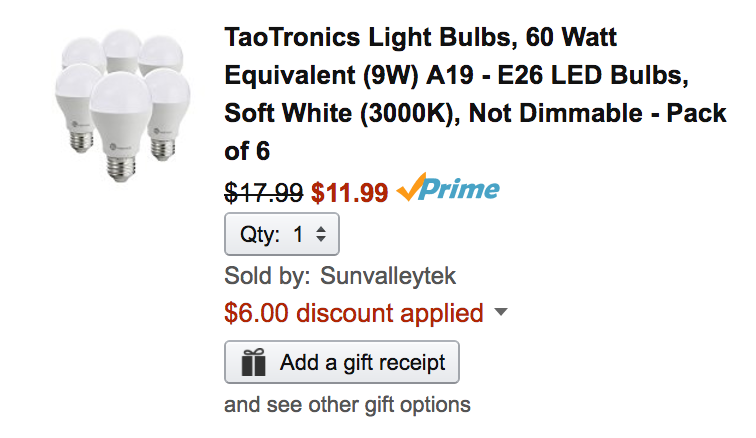 Sunvalleytek (99% positive feedback all-time from 262,000+ customers) via Amazon offers a six-pack of TaoTronics 60W A19 Soft White LED Light Bulbs for $11.99 Prime shipped when promo code ZTF822WF is applied during checkout. That’s a $6 savings off the regular going rate and the best offer currently available. It’s time to finally make the jump to these best-selling LEDs, and save a nice chunk of change along the way. You’ll be able to cash in on lower energy consumption over the 25,000 hour life of these bulbs. Rated 4.7/5 stars by over 1,300 Amazon customers.